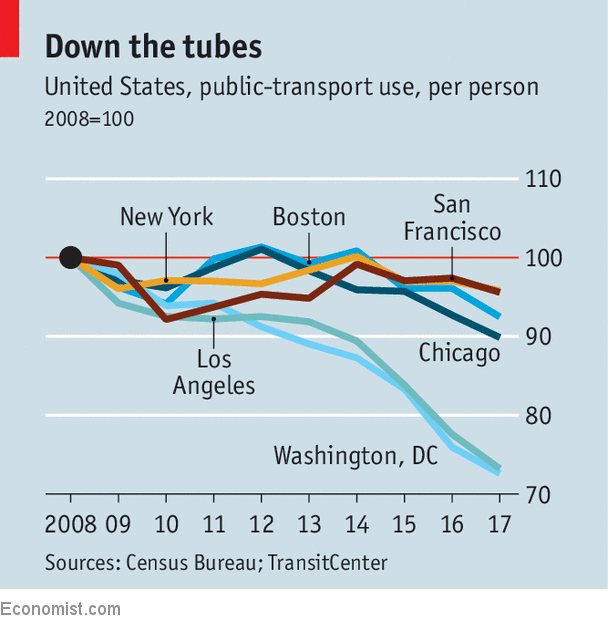 Below are data from The Economist re public transit's problems in major U.S. cities. This is old news. Most people prefer their private modes, mainly autos. But people's preferences are a distant second (or worse) when it comes to political allocations. There, Bootleggers and Baptists rule. Private transit allocations are also in the news. Voluntary investments flow to where there are prospects of demand. Here are Matt Kahn's musings re The Bird. It (and others that are already on the case and more that will follow) might even be a last-mile option for some would-be transit users. That might slow the long-term decline ("down the tubes") which goes back much further than the chart shows, no matter how big the subsidies. An all-bus system for LA, including buses on freeways, had been suggested as early as the 1960s. But Manhattan dreams have always been a badge of urbanist sophistication. A great irony. Planners now promise even more of poorly performing rail. The dream (mendacity) goes on no matter decades of poor performance. Costs will continue to escalate and bus service will be cut further. Policy and reality will keep drifting further apart. Disruptions describe innovation and competition in the modern market economy. Innovators provide the app and the platform -- and fill in with "gig" workers who, in this case, take care of the refueling and re placing them around town.